Fetal pain studies: Research doesn't support abortion bans at 20 weeks. 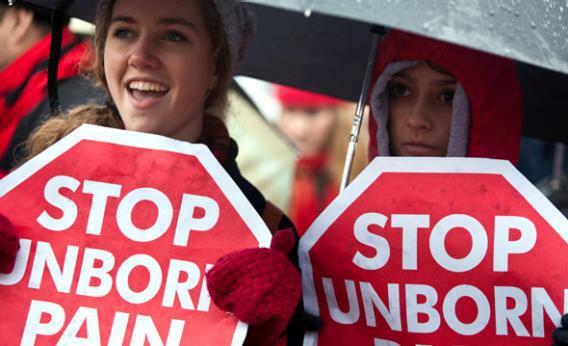 The doctors cited by pro-lifers say their fetal pain research doesn’t support abortion bans. Fetal pain protesters gather at the annual March for Life rally in Washington, D.C., on Jan. 23, 2012. In much of this country, over the last three years, pro-lifers have banned abortions 20 weeks after fertilization. They’ve justified these bans by asserting—contrary to the most authoritative studies—that fetuses at this stage of development can feel pain. Their assertions, in turn, are based on research by several doctors. But the doctors don’t buy the pro-lifers’ conclusions. They say their research doesn’t support the bans. The 12 state bans (several of which have been blocked or limited by courts) begin with legislative “findings.” The findings parrot a 33-page report posted by the National Right to Life Committee and other pro-life organizations. The report cites the work of a number of researchers. Pam Belluck, an enterprising New York Times correspondent, contacted the researchers and asked them about the abortion bans. It turns out there’s a big gap between the science and the legislation. The report also cites Dr. Mark Rosen, a fetal anesthesia pioneer, 16 times. Rosen’s work, the report suggests, shows that painkillers and anesthesia are common during fetal surgery because unborn children can feel pain. But Rosen tells Belluck that the real purpose of such drugs during fetal surgery is to minimize dangerous movement and harmful stress hormones, thereby facilitating recovery. The drugs don’t signify medical belief in fetal pain. Dr. Scott Adzick, another fetal surgery expert cited in the pro-life report, makes the same point. Anand doesn’t seem to like these sweeping bans. He tells Belluck that women and doctors should apply their judgment in the context of each case. “In the very few abortions where fetal pain could possibly occur,” he adds, we should “consider what can be done to avoid inflicting a lot of pain on the fetus.” One option, he notes, is to inject a lethal drug that quietly stops the fetal heart. Many late-term abortionists do precisely that. Another option is anesthesia. It’s easy to prevent fetal pain without forcing women to carry their pregnancies to term. The 20-week bans enacted by the states gloss over this gap. Their boilerplate language, mirroring the federal Pain-Capable Unborn Child Protection Act, concludes that “there is substantial medical evidence that an unborn child is capable of experiencing pain” at 20 weeks. In the next breath, they declare, “It is the purpose of this state to assert a compelling state interest in protecting the lives of unborn children from the stage at which substantial medical evidence indicates that they are capable of feeling pain.” The underlying sleight of hand, from preventing pain to “protecting the lives of unborn children,” is never explained, despite Dr. Anand’s observation that the two policies are medically and morally distinct. To my knowledge, no pollster has offered respondents the option of requiring fetal anesthesia or lethal injection prior to abortion after 20 weeks. How many people who show up in surveys as supporters of an abortion ban at 20 weeks, based on fetal pain, would drop that position and switch to the injection/anesthesia option? How many more would back off if the doctors in Belluck’s story came forward to testify about misunderstandings and misrepresentations of their work? A little more truth in this debate wouldn’t hurt.